Human deoxyribonuclease I (DNase I) is an endonuclease that catalyzes the hydrolysis of extracellular DNA and is just one of the numerous types of nucleases found in nature. The enzymatic mechanism for a single turnover is reasonably well understood based on biochemical and structural studies that are consistent with divalent metal ion dependent nonspecific nicking of a phosphodiester bond in one of the strands of double stranded DNA. 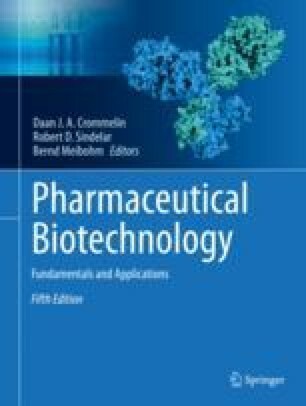 Recombinant human DNase I (rhDNase I, rhDNase, Pulmozyme®, dornase alfa) has been expressed in mammalian cell culture in Chinese hamster ovary cells and developed clinically where it is aerosolized into the airways for treatment of pulmonary disease in patients with cystic fibrosis (CF). rhDNase I hydrolyzes the DNA in purulent sputum of CF patients and reduces sputum viscoelasticity. Reduction of high molecular weight DNA into smaller fragments by treatment with aerosolized rhDNase I has been proposed as the mechanism to reduce the mucus viscosity and improve mucus clearability from obstructed airways in patients. The improved clearance of the purulent mucus enhances pulmonary function and reduces recurrent exacerbations of respiratory symptoms. rhDNase I was approved for clinical use in 1993 and has been widely used as a safe and effective therapy for CF patients. The use of rhDNase I has also been investigated in other diseases where exogenous DNA has been implicated in the disease pathology. †This chapter is dedicated in honor of a lifetime of scientific and clinical contributions by Jeffrey S. Wagener, deceased October 24, 2018.